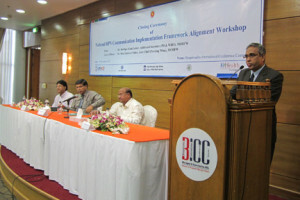 The Bangladesh Knowledge Management Initiative (BKMI) in partnership with the Ministry of Health and Family Welfare (MOHFW) organized a workshop from November 6-8, 2012 at the Bangabandhu International Conference Hall, called the Bangladesh Communication Implementation Framework Alignment & Action Workshop. Between 55-65 attendees participated over three days from the Bangladesh Ministry of Health and Family Welfare Directorates of Health Services and Family Planning, development agencies, private sector, NGOs, and others from the BCC Working Group. During the workshop participants from the different sectors worked together to create a shared vision for coordinated health, population and nutrition communication in Bangladesh, and identified the common strengths, weaknesses, opportunities, and threats for achieving this vision. Finally interventions were proposed and organizations committed to support them based on mandate, resources and authority. 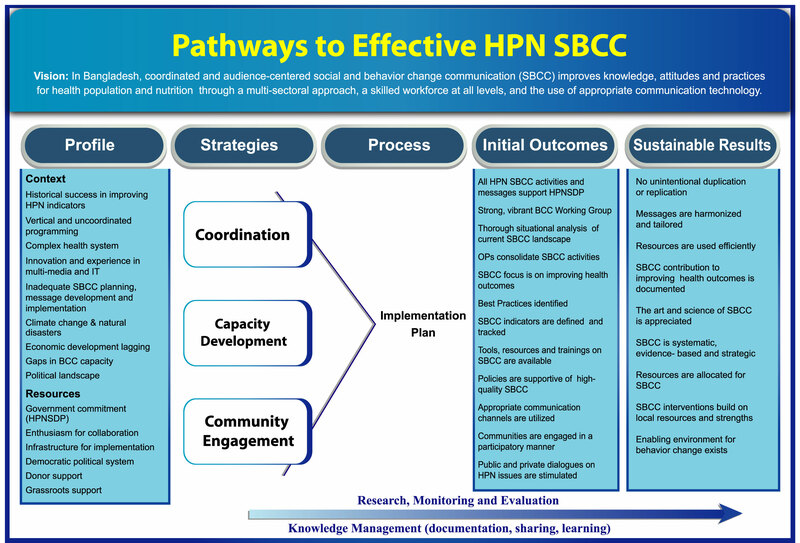 A draft roadmap to creating the alignment framework was developed that coordinates activities across partners in support of the Bangladesh Ministry of Health and Family Welfare’s Health, Population and Nutrition Sector Development Programme (HPNSDP) 2011-2016. A multi-sectoral steering committee of volunteers from the workshop are now responsible for working within the BCC working group to further develop the framework’s components.